I have a confession to make. While I am a self-professed skincare junkie -- seriously, I'm quite obsessed -- I don't always actually take care of my skin like I should. For example, the only time I use a mask is during a facial. (Oops.) I usually don't like the feeling of a heavy mask that adheres to the skin and feels like it should be removed with a hammer. Well, that has changed recently, thanks to the Eve Lom Rescue Mask. A bit of an impulse purchase during a recent trip to Space NK, this mask has quickly become my skincare mainstay. It's formulated with kaolin china clay (to reduce puffiness and even skin tone), honey and glycerin (to hydrate and condition) and ground roasted almonds (to exfoliate and smooth the complexion). I love the thick, rich and dense texture of the mask. It feels almost like a thick moisturizer when applied, and has a cooling effect that immediately soothes the skin. Left on for 15 minutes and then removed with a wet washrag, it leaves skin looking and feeling soft and smooth. It removed any trace of dry skin from my visage and gave me a dewy glow after just one use! My skin has seriously never looked or felt better. I'm a mask convert! 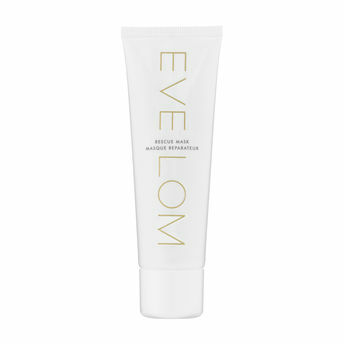 The Eve Lom Rescue Mask is $50 at spacenk.com.